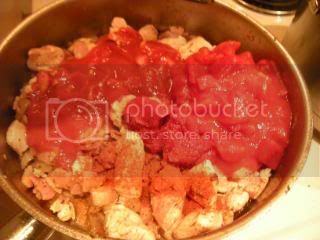 This one is a wonderful weeknight meal. 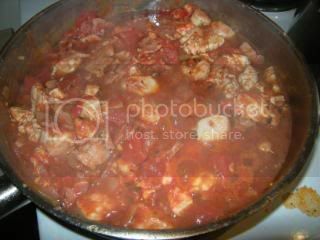 Easy and fast to prepare, filling, it makes heaps, and everyone eats it (in our house, anyway!). This is a creamy version. Although I normally make it sans cream, if I have some cream in the fridge left over from other things (sour cream works well, but pure cream is best. You can also use thickened or dollop cream with success) I’ll throw it in to use it up. Other variations, like most pastas, are legion. Use prosciutto in place of the bacon; add capsicum, snow peas, shallots, and baby corn for a vegie hit; mix chopped camembert through it at the last minute for something a little different. I prefer to serve this on top of the fresh filled pastas – I’ve used a beef ravioli this time – but it’s just as good on ordinary dried pasta. 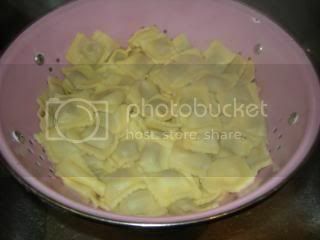 Pick a large pasta shape – big shells or fat spirals – to hold in the sauce, which is very chunky. If you want it to look fantastic as well (if you’re making it for a dinner party, or you’re seriously trying to impress that new partner) then choose a tri-colour or other colourful pasta to really liven it up. Garnish with a little parmesan and a sprig of basil (if yours hasn’t died in the frost, yet, like mine!) and it will impress any gourmand! 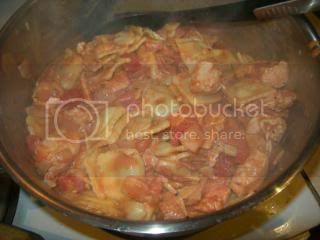 Here’s our cast: chicken (one full breast, or two halves); bacon (four or five rashers); pasta (pick your poison, I’ve got a fresh beef ravioli); passata (we’ll only use about a third of this jar, put the rest in the fridge, it keeps quite well); extra-virgin olive oil; diced tomatoes (if you can, pick a brand that leaves the tomato in big chunks. Fresh also works really well in this recipe, you’ll need four or five good sized tomatoes, peeled and deseeded); tomato paste (around 2-3 tablespoons, or half a small tin); minced garlic (if you’re using fresh, mince four cloves); an onion; pure cream (just a few tablespoons, and it’s entirely optional); herbs – basil, ground chillies, and oregano (use fresh if you have it, but dried is fine). Start with the onion. 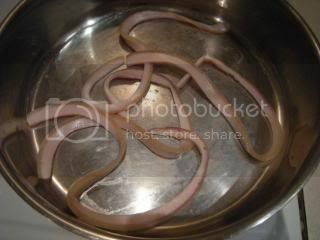 Chop the top off, split it in half down the middle, and peel the skin back. Use your paring knife to cut it lengthways into five or six sections, leaving it intact at the bottom. 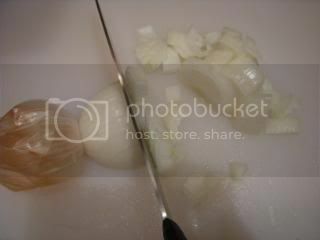 Cut the onion crossways, to create a fairly large dice. 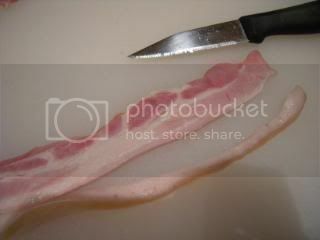 Now for the bacon. Strip the rinds off and put them aside, we’re going to use them yet. 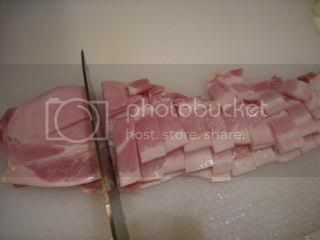 Slice up the rashers into chunky pieces. It’s a bit hard to see, but I’ve sliced the eyes down the middle, so that the pieces don’t get too long. We’re aiming for big, squarish chunks in this sauce. 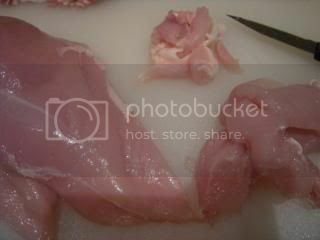 If you buy your chicken from a butcher (rather than the supermarket), you probably get it in full breasts, rather than halves. If that’s the case, then you need to remove the small piece of cartilage that runs down the middle. Use a sharp paring knife, or a boning knife if you have one, and cut down either side of the cartilage. Try not to cut away too much of the meat while you’re doing it. If you have the tenderloins attached, remove them. 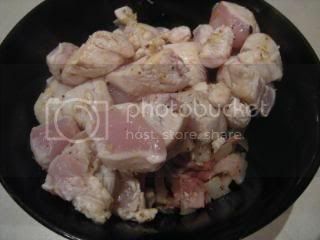 Also remove the visible white fat. So here you can see the three components: the breasts themselves on the left, the fat and cartilage in the middle, and the tenderloins on the right. 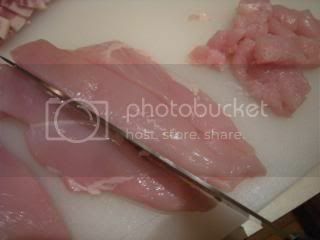 Chop up the tenderloins into chunks. 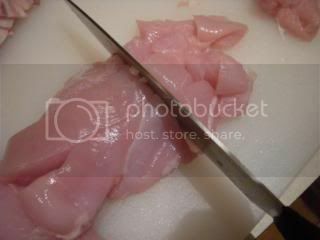 Depending on the size of the breasts, cut them lengthways either twice or three times. You want to aim for about 2-3cm strips. Then dice them into cubes. 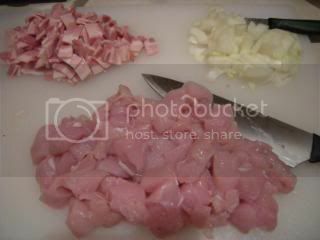 So here we have the chopping done: bacon, onion, and chicken. All in nice big chunks. 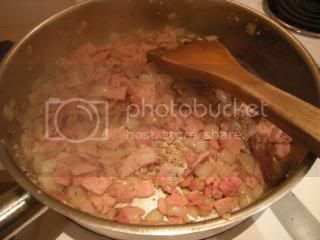 Throw the bacon rinds into a cold pan, and turn the heat on to medium. 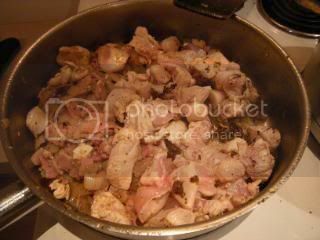 You might need to let the bacon fat cool a little first, as it tends to get very hot, but just for a second. 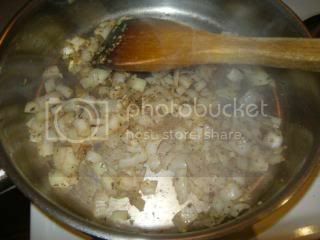 Then throw in the onion, the garlic, the basil and the oregano. 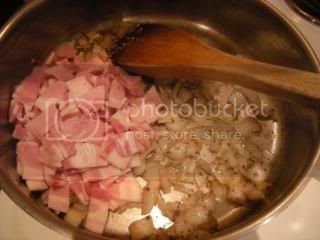 Keep stirring, until the bacon is all cooked, and the onion is transparent. 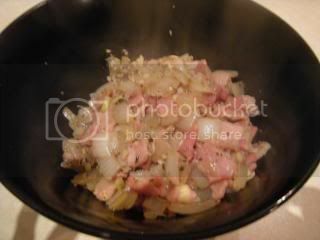 Put the onion and bacon mixture aside in a bowl. 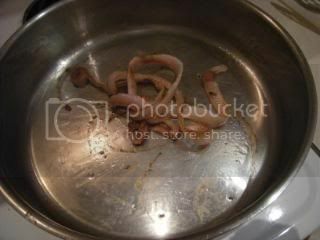 Slurp in a bit of olive oil to your pan. 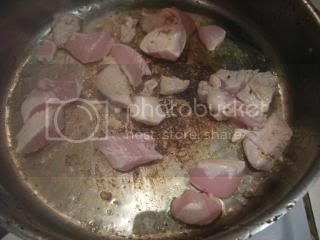 And very lightly brown off the chicken. 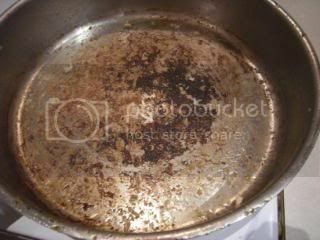 Do this in small patches to avoid overcrowding the pan. 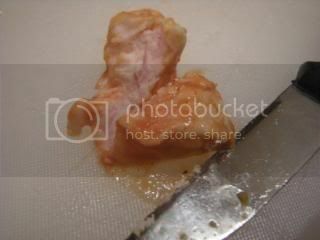 We want that lovely bacony stuff on the bottom to transfer to our chicken to get the flavour through. 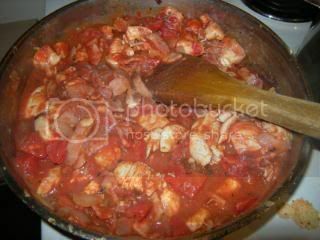 We don’t want to cook the chicken, and we certainly don’t want to stew it! 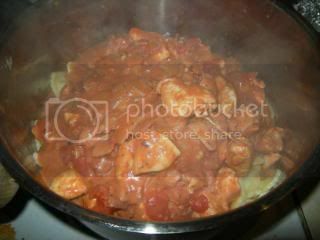 Put the chicken aside in the bowl as you cook each batch. And here’s our lovely hot pan – full of lovely burnt-on bacon and chickeny goodness. Let’s deglaze it. White wine is the best, but if you opened the fridge (like me) and went “Oh no! The horror! 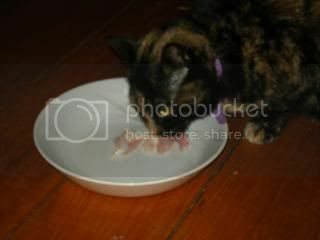 No wine!”, then when you get back up off the floor, use about a cup of chicken stock, or even just plain water. Stand well back, and pour the wine (or stock. 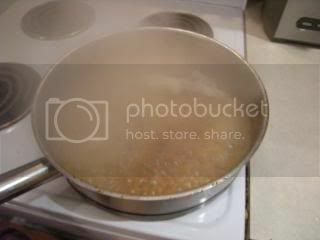 or water) into the hot pan. Let it sizzle and reduce for a few minutes. 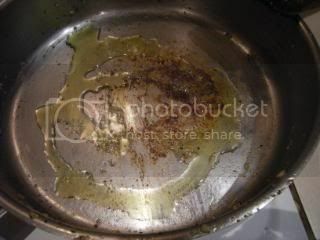 Give it a bit of a gentle scrape with your spatula, and admire the good stuff now floating around in the pan. Mmmmmmmm. Oh, whoops. Where was I? 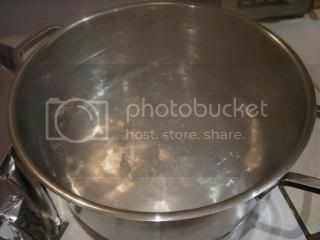 You probably want to think about getting a big pot of water on to boil around about now. 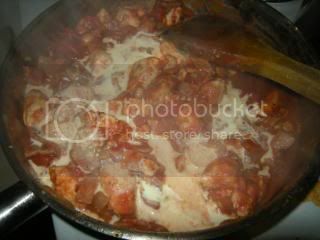 Turn the heat down to low, and throw the chicken, bacon, and onion mixture back into the pan. Stir it all around (You do the hokey pokey, and you turn a-round …). 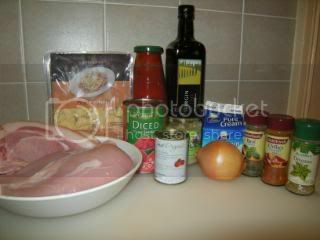 Add in the tin of tomatoes, the chilli, and about a third of the jar of passata. 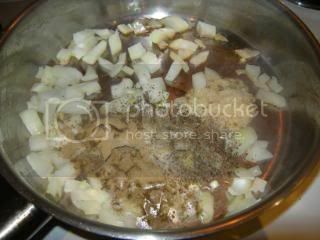 And cover it to simmer. 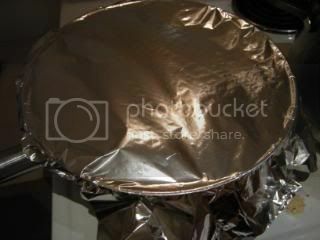 If you’re cheap, then just throw some foil over the pan. Now, I haven’t added any salt to this water. I also haven’t added any oil. Shall I repeat myself? Don’t add any salt. Or oil. Or anything. I don’t care what kind of pasta you’re cooking. 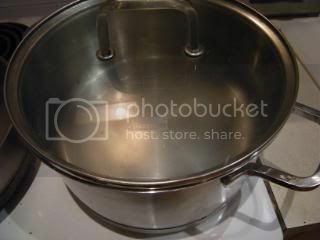 If you have the water at a rolling boil before it goes in, you stir it just after you put in the pasta, and again about halfway through, it won’t stick. Take my word for it. I’ve had arguments over this that raged for months. Just try it … (who really needs any extra salt in their diet anyway?). 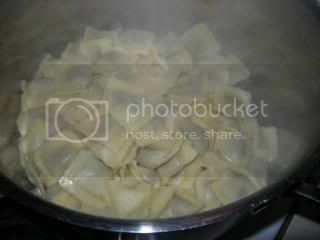 Throw the pasta in and wait for it to come back to the boil. Give it a stir, then set your kitchen timer. If it’s fresh pasta, time it for 8 minutes. For dried pasta, make it 12. Take the top off the sauce and check it out. Give it a good stir, have a taste. 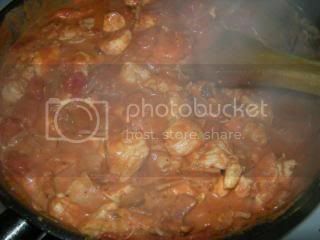 Now is the time to add more chilli if you want, perhaps a dash of Tabasco. Remember that if you’re adding cream, it will turn the heat down a fair bit, so over-spice rather than under-spice. You could also throw in some finely shredded spinach right now, and that would be awesome. If I did that, I’d probably have a revolt on my hands, though. 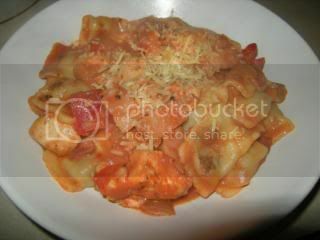 More pasta for me! 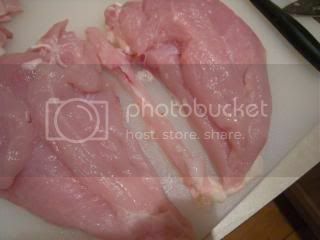 The moment of truth: pull out a big piece of chicken (bigger pieces take longer to cook, so they’re the best for testing), and chop it in half right down the middle. It should be just on the white side of pink. Very white, and it’s overcooked and chewy. Very pink, and it’s undercooked and likely to give your diners some awful bug. Try and aim for somewhere in the middle, nice and tender, but not overcooked and dry. If you’re happy with the chicken, drizzle in some cream. How much you use is up to your own taste, but start small. It’s easy to add more, but you’ll have a hell of a time trying to get rid of it. Stir it through, give it a taste. Try not to eat too much before it gets to the table. When the pasta is done, throw it into the colander, and drain it really well. 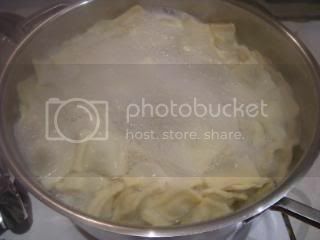 Then pour it back into the pot you cooked it in. Pour the sauce in on top of the pasta. And stir it through. If you’ve used fresh pasta, avoid metal spoons and spaghetti servers (those spoon things with the sticking up prongs), as they’ll break up the pasta and you’ll end up with a horrid mess. 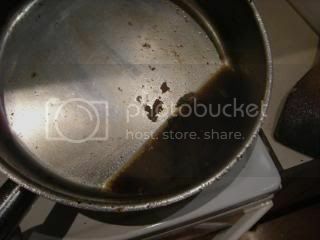 I use one of the black ‘non-stick’ spoons. It’s less violent. 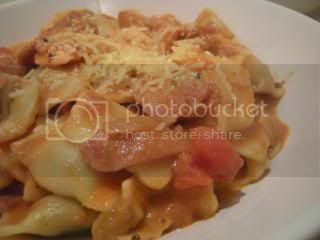 Plop it into pasta bowls, sprinkle some parmesan on top, and garnish with a sprig of basil. OK, you’ll have to imagine the basil. Mine died in the frost. Eat. Enjoy. Share with friends. Or keep it all to yourself, and consume with a bottle of wine. 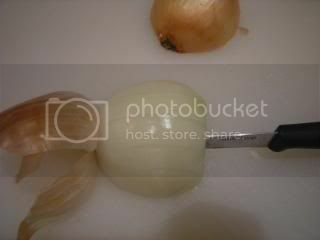 Photos are up at Photobucket.